In no small part, the apocalyptic potential of 2010 Olympics in Vancouver forced ZULA into exile in 2007. From 2007 to 2009 Gabriola Island was home. 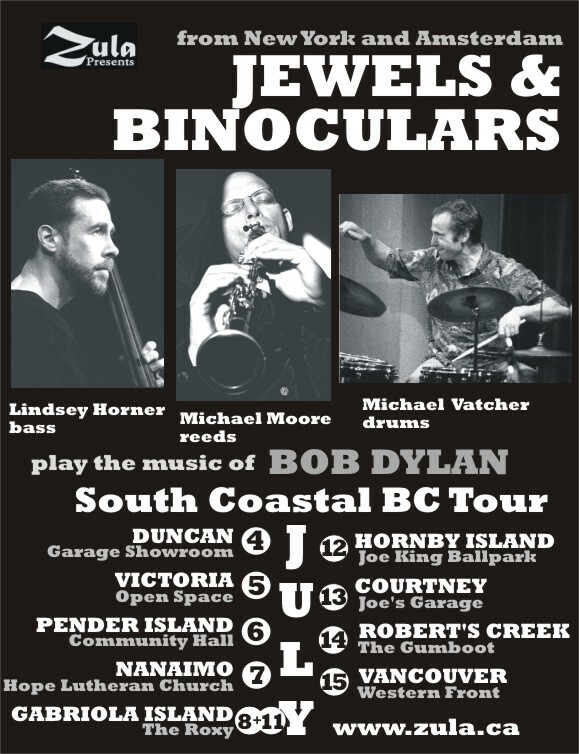 Zula is pleased to announce the return of Jewels & Binoculars — New York bassist Lindsey Horner, American ex-pats, Amsterdam residents, reedsman Michael Moore and percussionist Michael Vatcher– with a tour of southern coast of BC. Three of the brightest, most original minds in jazz & creative music perform Bob Dylan’s music with great love & respect, getting inside those gorgeous songs and opening them up with great skill, beautifully, like you’ve never heard them before. These creative versions are sure to be lodged deep in your psyche for eternity. 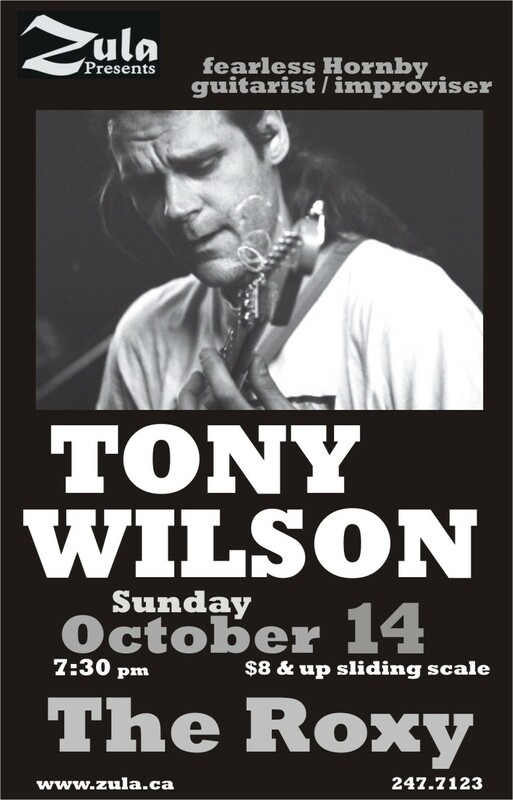 Zula presents veteran Hornby Island guitarist, composer, fearlessly creative improviser, Tony Wilson, who will perform solo for fans of adventurous music in the intimate confines of The & Loan Gallery and The Roxy. A natural, musically omnivorous player, Wilson’s contributions to the Canadian creative music scene have been immense, mainly via his close working relationships with the finest players in Vancouver’s jazz and creative music community. Past projects have included Video Barbeque, Celtic Works, Bugs Inside, Flowers for Albert, The Monkaholics. 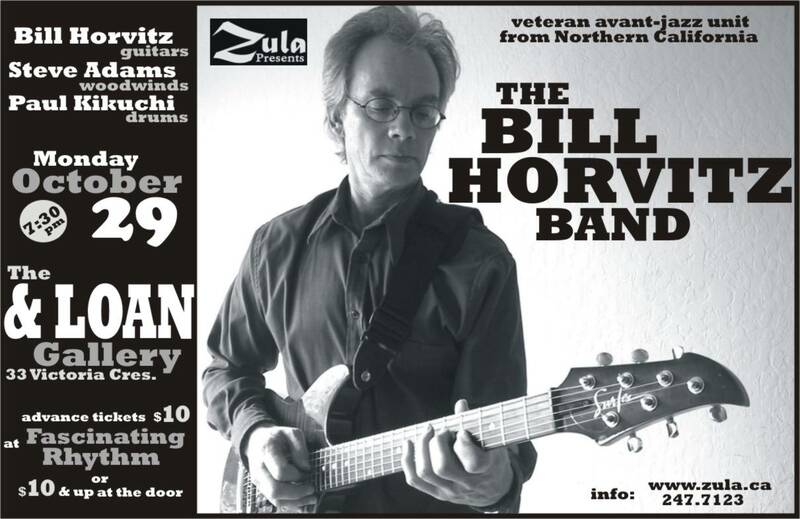 His current working groups are both sextets, one composed of the younger generation of Vancouver’s finest (Jesse Zubot, Masa Anzai, JP Carter, Russell Sholberg & Skye Brooks), the other composed of Tony’s generation of players (Peggy Lee, Dave Say, Kevin Elaschuk, Paul Blaney & Dylan van der Schyff). Aside from duo projects, he tours and composes at a steady pace. He has performed with some of the greatest practitioners and proponents in jazz and creative music worlds including Vinny Golia, Myra Melford, Gerry Hemingway, Han Bennink, William Parker & the like. A typical solo performance by Tony Wilson may include, along with his own compositions, some avant-garde material, some noise, some simple melodies and country & western motifs, even some kora playing and singing. Tony is an alumni of the Malaspina College’s Jazz Program. Visiting us from Northern California, this creative music/jazz trio moves with fluid grace between tight compositions and improvised solo and ensemble work, communicating with a telepathic rapport. Driving swing, lyrical ballads, and funky grooves all contribute to an exciting performance that moves the head, heart, and soul. 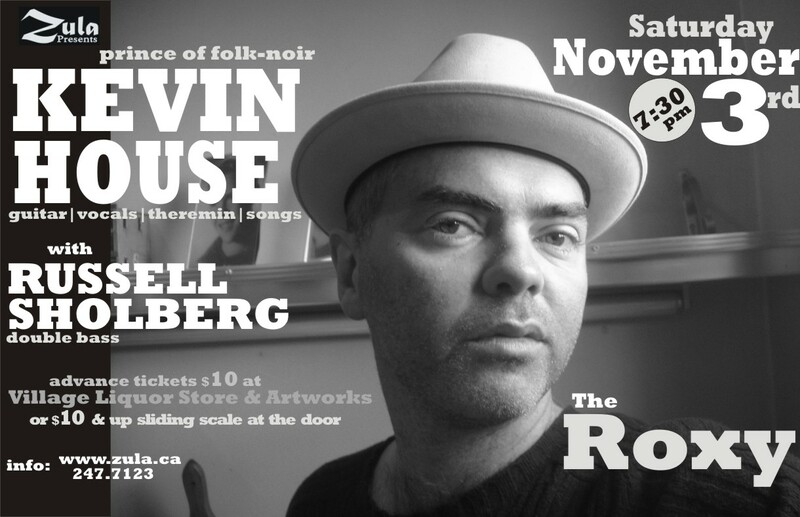 Specializing in soulful, quiet, impressionistic mood pieces with vivid metaphors, troubadour -guitar, vocals, theremin and more- Kevin House’s intimate, ornate, burnished songs with beautiful melodies will stay with you, when he visits The Roxy on Gabriola and The & Loan Gallery in Nanaimo. House has performed live with Gillian Welch, Mercury Rev, Jim White, Evan Dando, and others. Check out Kevin’s website & myspace page for more info and samples of his music. He is also an acclaimed painter whose work has been discovered and commissioned by actor Malcolm McDowell and CBC host Bill Richardson; as well as covers for Bark! and Girlyhead magazines. 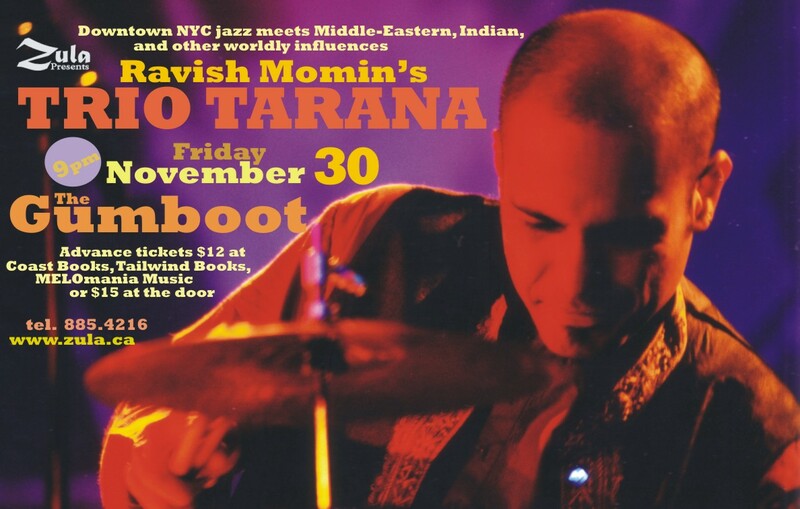 Born in India, based in New York, creative percussionist/composer Ravish Momin brings together his creative music, folk and jazz influences in fresh, unorthodox ways with Trio Tarana, an exciting project with interesting instrumentation and stellar musicians, Brandon Terzic on oud & Skye Steele on violin.